Which ships are in port? 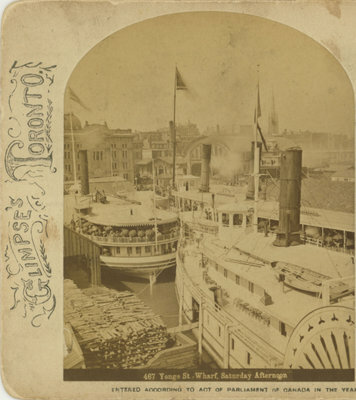 Stereoview of the Yonge Street wharf. At least four steamboats are in port. Three of the four have passengers on board, many of them holding up umbrellas to shield them from the sun. In the foreground there is a large stack of cordwood waiting to be carried across the gangplank. Behind the steamboats is Toronto's second Union Station.